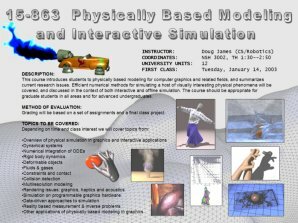 This course introduces students to physically based modeling for computer graphics and related fields, and summarizes current research issues. Efficient numerical methods for simulating a host of visually interesting physical phenomena will be covered, and discussed in the context of both interactive and offline simulation. The course should be appropriate for graduate students in all areas and for advanced undergraduates. The prerequisite will be 15-462 Computer Graphics I (or equivalent undergraduate course) or permission of the instructor. Students should have prior exposure to numerical computation. There will be no single text. Selected articles, book chapters, and course notes will be made available online. Grading will be based on a set of assignments, a final class project and a presentation (see chart below). Collaboration and group final projects are encouraged but must be coordinated through the instructor. You have 5 late days that you may use for any of the assignments during the quarter but further extensions require an excellent excuse. Assignments are submitted electronically in your usernamed directory off /afs/cs.cmu.edu/academic/class/15863-s03. After logging in to your andrew account, you will need to run the command "cklog cs.cmu.edu" to access your directory. Feel free to code assignments in your preferred programming language. However all assignments must be accompanied by a video showing system performance. Below are some suggested software libraries. Differential-Algebraic Equations, SIAM, 1998. ISBN 0-89871-412-5. No class. Read SIGGRAPH course notes. Any introductory text on Lagrangian mechanics, e.g., Goldstein or Marion & Thornton. J. Baumgarte. Stabilization of constraints and integrals of motion in dynamical systems. Comp. Methods Appl. Mech., 1:1-16, 1972. D. P. Dobkin and D. G. Kirkpatrick. Determining the separation of preprocessed polyhedra: a unified approach. In Proc. 17th Int. Colloq. Automata, Languages, and Programming, Lect. Notes in Comput. Sci., vol. 443, Springer-Verlag, pages 400--413, 1990. I-COLLIDE: Interactive and Exact Collision Detection for Large-Scale Environments, by Cohen, Lin, Manocha & Ponamgi, Proc. 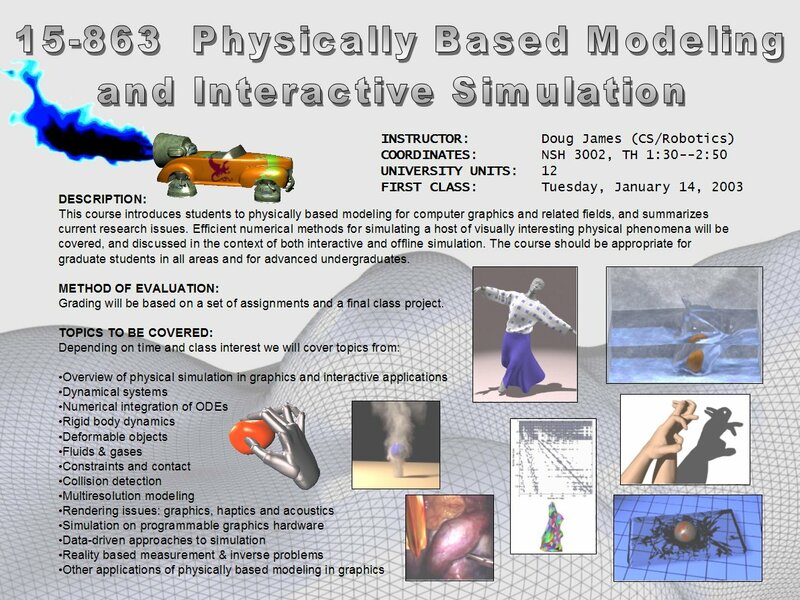 of ACM Symposium on Interactive 3D Graphics, 1995. Matthew Moore , Jane Wilhelms, Collision detection and response for computer animation, SIGGRAPH 88. Fast Penetration Depth Computation For Physically-based Animation,Young J. Kim, Miguel A. Otaduy, Ming C. Lin, Dinesh Manocha, ACM SIGGRAPH Symposium on Computer Animation. pp. 23-32, 2002. Efficient collision detection using bounding volume hierarchies of k-dops, by J. Klosowski, M. Held, J. S. B. Mitchell, H. Sowizral, and K. Zikan, IEEE Trans. on Visualization and Computer Graphics, 4(1):21--37, 1998. Collision Detection between Geometric Models: A Survey, by M. Lin and S. Gottschalk, Proc. of IMA Conference on Mathematics of Surfaces 1998. John M. Snyder , Adam R. Woodbury , Kurt Fleischer , Bena Currin , Alan H. Barr, Interval methods for multi-point collisions between time-dependent curved surfaces, Proceedings of SIGGRAPH 93, p.321-334, September 1993. (Check out the "Fruit Tracing" example... with a lobster!). John M. Snyder, An interactive tool for placing curved surfaces without interpenetration,Proceedings of ACM SIGGRAPH 95, p.209-218, September 1995. Goldstein, H., Classical Mechanics, Addison-Wesley, Reading, 1983. Featherstone, R., Robot Dynamics Algorithms, Kluwer, Boston, 1987. R. M. Murray, Z. Li, and S. S. Sastry, A Mathematical Introduction to Robotic Manipulation, CRC Press, first edition, 1994. (See Chapter 1 hand-outs). See Jeff Trinkle's page on multibody dynamics. Includes a nice survey of simulation packages and projects. David Baraff, Curved surfaces and coherence for non-penetrating rigid body simulation, Proceedings of ACM SIGGRAPH 94, Volume 24 , Issue 4 (August 1990). David Baraff, Fast contact force computation for nonpenetrating rigid bodies, Proceedings of ACM SIGGRAPH 94, p.23-34, July 1994. Brian Mirtich , John Canny, Impulse-based simulation of rigid bodies, Proceedings of the 1995 symposium on Interactive 3D graphics, p.181-ff., April 09-12, 1995, Monterey, California, United States. Brian Mirtich, Timewarp rigid body simulation, SIGGRAPH 2000, pp. 193-200, ACM SIGGRAPH, 2000. Paul G. Kry and Dinesh K. Pai, Continuous Contact Simulation for Smooth Surfaces, Transactions on Graphics, Vol 22, No 1, January, 2003. D. Baraff. Linear-time dynamics using Lagrange multipliers. ACM SIGGRAPH 96, 137-146, 1996. U. M. Ascher, D. K. Pai and B. Cloutier, Forward Dynamics, Elimination Methods, and Formulation Stiffness in Robot Simulation. International Journal of Robotics Research, 16:6, pp. 749--758, December 97. François Faure, Fast Iterative Refinement of Articulated Solid Dynamics, IEEE Transactions on Visualization and Computer Graphics, 5(3), pp. 268-276, 1999. U. Ascher and P. Lin, Sequential Regularization Methods for simulating mechanical systems with many closed loops, SIAM J. Scient. Comput. 21, 1244-1262, 1999. Karl Sims, Evolving virtual creatures, Proceedings of ACM SIGGRAPH 94, p.15-22, July 1994. Stephen Chenney, D. A. Forsyth, Sampling Plausible Solutions to Multi-Body Constraint Problems, Proceedings of ACM SIGGRAPH 2000. pp. 219-228, 2000. Jovan Popović, Steven M. Seitz, Michael Erdmann, Zoran Popović, Andrew P. Witkin, Interactive Manipulation of Rigid Body Simulations, Proceedings of ACM SIGGRAPH 2000, pp. 209-218, 2000. D. James and D. K. Pai, ArtDefo, Accurate Real Time Deformable Objects, In Proceedings of ACM SIGGRAPH 99, Annual Conference Series, pp. 65--72, August 1999. Black-box (data-driven) introduction to linear elastostatic models. Morten Bro-Nielsen, Stephane Cotin, Real-time Volumetric Deformable Models for Surgery Simulation using Finite Elements and Condensation, Computer Graphics Forum, 1996. Stéphane Cotin, Hervé Delingette, Nicholas Ayache, Real-time elastic deformations of soft tissues for surgery simulation, IEEE Transactions on Visualization and Computer Graphics, 5 (1), 62-73, 1999. William W. Hager, Updating the inverse of a matrix, SIAM Review, 31, 221--239, 1989. Survey of selected formative works on deformation. Alan H. Barr, Global and Local Deformations of Solid Primitives, Computer Graphics (Proceedings of SIGGRAPH 84). 18(3), pp. 21-30, 1984. Thomas W. Sederberg, Scott R. Parry, Free-Form Deformation of Solid Geometric Models, Computer Graphics (Proceedings of SIGGRAPH 86). 20(4), pp. 151-160, 1986. Sabine Coquillart, Extended Free-Form Deformation: A Sculpturing Tool for 3D Geometric Modeling,Computer Graphics (Proceedings of SIGGRAPH 90). 24(4), pp. 187-196, 1990. William M. Hsu, John F. Hughes, Henry Kaufman, Direct manipulation of free-form deformations, Computer Graphics (Proceedings of SIGGRAPH 92). 26(2), pp. 177-184, 1992. Ron MacCracken and Kenneth I. Joy. Free-form deformations with lattices of arbitrary topology. ACM SIGGRAPH 96, pages 181–188. ACM Press, 1996. Karan Singh, Eugene L. Fiume, Wires: A Geometric Deformation Technique, Proceedings of SIGGRAPH 98. pp. 405-414, 1998. Terzopoulos, D., Platt, J., Barr, A., and Fleischer, K., Elastically Deformable Models, ACM SIGGRAPH 87, 205-214, 1987. John C. Platt, Alan H. Barr, Constraint methods for flexible models, ACM SIGGRAPH Computer Graphics, June 1988. Demetri Terzopoulos, Andrew Witkin, Physically Based Models with Rigid and Deformable Components, IEEE Computer Graphics & Applications. 8(6), pp. 41-51, 1988. Alex Pentland, John Williams, Good Vibrations: Modal Dynamics for Graphics and Animation, Computer Graphics (Proceedings of SIGGRAPH 89). 23(3), pp. 215-222, 1989. Dimitri Metaxas, Demetri Terzopoulos, Dynamic deformation of solid primitives with constraints, ACM SIGGRAPH Computer Graphics, 26(2), p.309-312, July 1992. David Baraff, Andrew Witkin, Dynamic simulation of non-penetrating flexible bodies, Computer Graphics (Proceedings of SIGGRAPH 92). 26(2), pp. 303-308, 1992. Marie-Paule Gascuel, An implicit formulation for precise contact modeling between flexible solids, ACM SIGGRAPH 93, p.313-320, September 1993. Demetri Terzopoulos , Hong Qin, Dynamic NURBS with geometric constraints for interactive sculpting, ACM Transactions on Graphics (TOG), v.13 n.2, p.103-136, April 1994. Petros Faloutsos, Michiel van de Panne, Demetri Terzopoulos, Dynamic Free-Form Deformations for Animation Synthesis, IEEE Transactions on Visualization and Computer Graphics. 3(3), pp. 201-214, 1997. Marie-Paule Cani-Gascuel, Mathieu Desbrun, Animation of Deformable Models Using Implicit Surfaces, IEEE Transactions on Visualization and Computer Graphics. 3(1), pp. 39-50, 1997. Sarah F. F. Gibson, 3D Chainmail: a Fast Algorithm for Deforming Volumetric Objects, 1997 Symposium on Interactive 3D Graphics. pp. 149-154, 1997. S. Gibson and B. Mirtich. A Survey of Deformable Modeling in Computer Graphics, Tech. Report No. TR-97-19, Mitsubishi Electric Research Lab., Cambridge, MA, November 1997. See previous class slides & references. My handout: James, "Summary of Collision Detection Algorithms for Deformable Models," unpublished, 2002. G. van den Bergen. Efficient Collision Detection of Complex Deformable Models using AABB Trees. Journal of Graphics Tools, 4(2):1--13, 1997. Read handouts from Shabana text for next week. Ahmed A. Shabana, Dynamics of Multibody Systems, Cambridge University Press, 2nd edition, April 1998. Adam Stettner, Donald P. Greenberg, Computer Graphics Visualization For Acoustic Simulation, Computer Graphics (Proceedings of SIGGRAPH 89). 23(3), pp. 195-206, 1989. Tapio Takala, James Hahn, Sound Rendering, Computer Graphics (Proceedings of SIGGRAPH 92). 26(2), pp. 211-220, 1992. Thomas A. Funkhouser, Patrick Min, Ingrid Carlbom, Real-Time Acoustic Modeling for Distributed Virtual Environments, Proceedings of SIGGRAPH 99. pp. 365-374, 1999. Perry Cook, Physically Based Parametric Sound Synthesis and Control, ACM SIGGRAPH Course Notes, 2000. Nicolas Tsingos, Thomas Funkhouser, Addy Ngan, Ingrid Carlbom, Modeling Acoustics in Virtual Environments Using the Uniform Theory of Diffraction, Proceedings of ACM SIGGRAPH 2001. pp. 545-552, 2001. Kees van den Doel , Paul G. Kry , Dinesh K. Pai, FoleyAutomatic: Physically Based Sound Effects for Interactive Simulation and Animation, SIGGRAPH 2001, p.537-544, August 2001. Dinesh K. Pai, Kees van den Doel, Doug L. James, Jochen Lang, John E. Lloyd, Joshua L. Richmond, Som H. Yau, Scanning Physical Interaction Behavior of 3D Objects, ACM SIGGRAPH 2001, p.87-96, August 2001. Perry R. Cook, Real Sound Synthesis for Interactive Applications, AK Peters, 2002. O'Brien, J. F., Shen, C., Gatchalian, C. M., Synthesizing Sounds from Rigid-Body Simulations, ACM SIGGRAPH 2002 Symposium on Computer Animation, San Antonio, Texas, July 21-22, pp. 175-182. Thomas Funkhouser, Jean-Marc Jot, Nicolas Tsingos, “Sounds Good to Me!” Computational Sound for Graphics, Virtual Reality, and Interactive Systems, ACM SIGGRAPH Course Notes, 2002. JASS (Java Audio Synthesis System). Kees van den Doel. Includes Java SDK, documentation, and applets. The Synthesis ToolKit in C++ (STK), Perry R. Cook and Gary P. Scavone. BEM for Acoustic Problems, Stephen Kirkup. Xavier Provot, Deformation Constraints in a Mass-Spring Model to Describe Rigid Cloth Behavior, Graphics Interface '95, pp. 147-154, 1995. 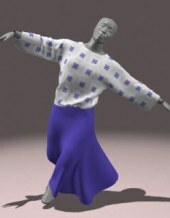 David Baraff and Andrew P. Witkin, Large Steps in Cloth Simulation, Proceedings of SIGGRAPH 98, pp. 43-54, 1998. D. E. Breen, D. H. House, P. H. Getto, A Physically-Based Particle Model of Woven Cloth, The Visual Computer. 8(5-6), pp. 264-277, 1992. David E. Breen, Donald H. House, Michael J. Wozny, Predicting the Drape of Woven Cloth Using Interacting Particles, Proceedings of SIGGRAPH 94. pp. 365-372, 1994. Robert Bridson, Ron Fedkiw, and John Anderson, Robust treatment of collisions, contact and friction for cloth animation, Proceedings of SIGGRAPH 2002, pages 594--603. Kwang-Jin Choi and Hyeong-Seok Ko. Stable but responsive cloth, Proceedings of SIGGRAPH 2002, pages 604--611, 2002. X. Provot, Collision and Self-collision Handling in Cloth Model Dedicated to Design, Computer Animation and Simulation '97, pp. 177-190, 1997. Martin Courshesnes, Pascal Volino, Nadia Magnenat-Thalmann, Versatile and Efficient Techniques for Simulating Cloth and Other Deformable Objects, Proceedings of SIGGRAPH 95, pp. 137-144, 1995. Ken-ichi Anjyo, Yoshiaki Usami, Tsuneya Kurihara, A simple method for extracting the natural beauty of hair, Computer Graphics (Proceedings of SIGGRAPH 92). 26(2), pp. 111-120, 1992. Ronen Barzel, Faking Dynamics of Ropes and Springs, IEEE Computer Graphics & Applications. 17(3), pp. 31-39, 1997. N.Magnenat-Thalmann, S.Hadap, P.Kalra, State of the Art in Hair Simulation, International Workshop on Human Modeling and Animation, Seoul, Korea, Korea Computer Graphics Society, pp. 3-9, June, 2002. Sunil Hadap, Nadia Magnenat-Thalmann, Modeling Dynamic Hair as a Continuum, Computer Graphics Forum, Volume 20, Issue 3, Eurographics 2001 Proceedings, Manchester, United Kingdom, September 2001. Eric Plante, Marie-Paule Cani, Pierre Poulin, Capturing the Complexity of Hair Motion, GMOD numéro 1 volume 64 , january 2002. Johnny T. Chang, Jingyi Jin, Yizhou Yu, A Practical Model for Hair Mutual Interactions, ACM SIGGRAPH Symposium on Computer Animation. pp. 73-80, 2002. Tae-Yong Kim, Ulrich Neumann, Interactive Multiresolution Hair Modeling and Editing, ACM Transactions on Graphics. 21(3), pp. 620-629, 2002. Dinesh K. Pai, STRANDS: Interactive Simulation of Thin Solids using Cosserat Models, Computer Graphics Forum. 21(3), pp. 347-352, 2002. Yan Zhuang and John Canny, Real-time Simulation of Physically Realistic Global Deformation, IEEE Vis'99 Late Breaking Hot Topics. San Francisco, California. October 24-29, 1999. Gilles Debunne, Mathieu Desbrun, Marie-Paule Cani, Alan H. Barr, Dynamic Real-Time Deformations Using Space & Time Adaptive Sampling, Proceedings of ACM SIGGRAPH 2001. pp. 31-36, 2001. Xunlei Wu, Michael S. Downes, Tolga Goktekin, Frank Tendick, Adaptive Nonlinear Finite Elements for Deformable Body Simulation Using Dynamic Progressive Meshes, Computer Graphics Forum. 20(3), pp. 349-358, 2001. Steve Capell, Seth Green, Brian Curless, Tom Duchamp, Zoran Popović, A Multiresolution Framework for Dynamic Deformations, ACM SIGGRAPH Symposium on Computer Animation. pp. 41-48, 2002. Eitan Grinspun, Petr Krysl, Peter Schröder, CHARMS: A Simple Framework for Adaptive Simulation, ACM Transactions on Graphics. 21(3), pp. 281-290, 2002. Wim Sweldens, The Lifting Scheme: A Construction of Second Generation Wavelets, SIAM Journal on Mathematical Analysis, 29(2), pages 511--546, 1998. Peter Schröder and Wim Sweldens, Spherical Wavelets: Efficiently Representing Functions on the Sphere, SIGGRAPH, ACM Press, Pages: 161 - 172, 1995. Terzopoulos, D. and Fleischer, K., Modeling Inelastic Deformation: Viscoelasticity, Plasticity, Fracture, ACM SIGGRAPH 88, 269-278, 1988. James F. O'Brien , Jessica K. Hodgins, Graphical Modeling and Animation of Brittle Fracture, Proceedings of the 26th annual conference on Computer graphics and interactive techniques, p.137-146, July 1999. F. Ganovelli, P. Cignoni, C. Montani, R. Scopigno, Enabling Cuts on Multiresolution Representation, The Visual Computer. 17(5), pp. 274-286, 2001. Andrew Mor, Progressive Cutting with Minimal New Element Creation of Soft Tissue Models for Interactive Surgical Simulation, doctoral dissertation, tech. report CMU-RI-TR-01-29, Robotics Institute, Carnegie Mellon University, 2001. James F. O'Brien , Adam W. Bargteil , Jessica K. Hodgins, Graphical Modeling and Animation of Ductile Fracture, ACM Transactions on Graphics (TOG), v.21 n.3, July 2002. Bernhard Eberhardt, Olaf Etzmuß, Michael Hauth, Implicit-Explicit Schemes for Fast Animation with Particle Systems, Computer Animation and Simulation 2000, Proceedings of the EG Workshop in Interlaken, 21-22 August, 2000. Mathieu Desbrun, Peter Schröder, Al Barr, Interactive Animation of Structured Deformable Objects, Graphics Interface '99. pp. 1-8, 1999. Randy LeVeque, Numerical Methods for Conservation Laws, Birkhauser Verlag, Boston, 2000. Staniforth, A., and J. Cote, Semi-Lagrangian integration schemes for atmospheric models - A review. Mon. Wea. Rev., 119, 2206-2223, 1991. Jos Stam, Stable Fluids, SIGGRAPH 99. pp. 121-128, 1999. 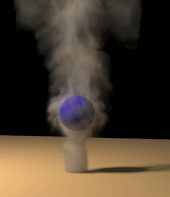 Fedkiw, R., Stam, J. and Jensen, H.W., Visual Simulation of Smoke, SIGGRAPH 2001, pp. 23-30, 2001. Stanley J. Osher, Ronald P. Fedkiw, Level Set Methods and Dynamic Implicit Surfaces, Springer Verlag, 1st ed., 2002. Nick Foster, Ronald Fedkiw, Practical Animation of Liquids, Proceedings of ACM SIGGRAPH 2001. pp. 23-30, 2001. Douglas P. Enright, Stephen R. Marschner, Ronald P. Fedkiw, Animation and Rendering of Complex Water Surfaces, ACM Transactions on Graphics. 21(3), pp. 736-744, 2002. Duc Quang Nguyen, Ronald P. Fedkiw, Henrik Wann Jensen, Physically Based Modeling and Animation of Fire, ACM Transactions on Graphics. 21(3), pp. 721-728, 2002.